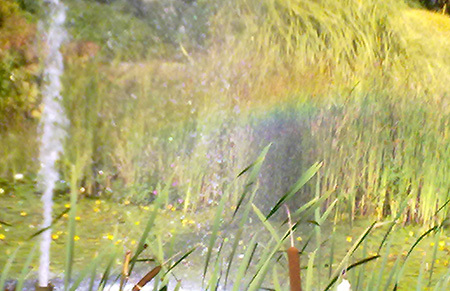 There’s a fountain near my work, and one day – a year or so ago – I saw this beautiful rainbow reflected in it as I walked past. I’ve never seen it since, but last week, as I was passing on a lovely sunny day, I decided to walk carefully around it and try my best to find the rainbow again. I did find it – photo below (snapped on my mobile). It’s not as good a rainbow as the one I saw by accident a year ago, but it does at least show that if you pass a fountain on a sunny day and try enough viewing angles you have a reasonable chance of finding a rainbow in it! Regarding the photo, I focussed into the distance in an attempt to make the rainbow clearer – didn’t work brilliantly but that is why the rest of the photo is not particularly in focus – this was deliberate. 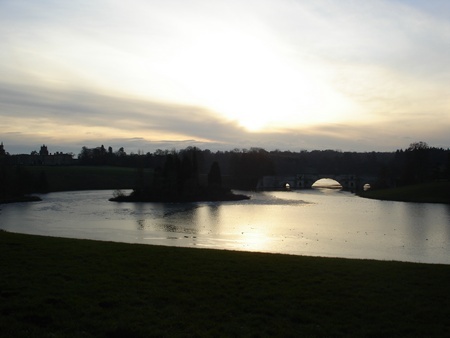 2011 has arrived, and the start of a new year is often an appropriate time to reflect over the past one. 2010 was a year of change for us as a family. I changed job half way through the year. A few months later we moved house and have been working our way through all the tasks that this entails since then. We’ve had other, sadder and harder changes to come to terms with this last year too. Too much change brings stress and exhaustion. I don’t think that this is good for you(!) – but I’ve known something of this reality over the last year. However change also brings us the chance to learn new things, to develop and grow. To give a trivial example. Our new house – the second we’ve bought – was also the second house that we’ve moved into with a broken letterbox in the front door. This had been fixed by the previous owners using glue but in time the fix came apart and the front plate came off – much like it had in our last house after I’d glued that! In our old house we eventually got a door repair company to come and change it. This time I was more adventurous and decided to try and fix it myself. I learned that actually this was very easy to do, that the mainstream DIY stores do not tend to stock replacement letter boxes for doors like ours, but that your can buy replacement letter boxes of all shapes and sizs on ebay! We now have a nice shiny new letter box on our door. It also cost rather less to fix this myself, than it does to pay for someone else to do it. I would hope that learning to fix uPVC door letter boxes has not been the most profound thing that I’ve learned through the changes of last year. While changes can be uncomfortable, life would be much less rich without the challenges of new circumstances to face. A school that gave the same lessons each day would not be one to recommend. Change while not always nice is often good for us. … a bit less change in 2011 would be nice though. 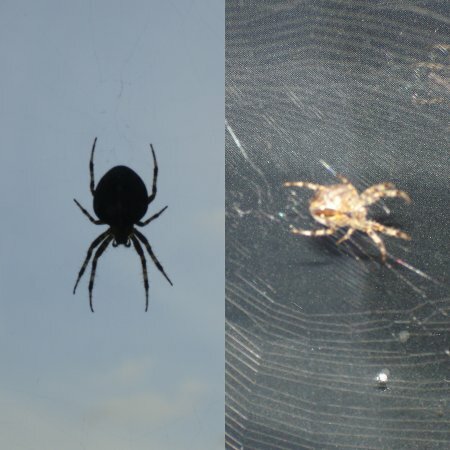 For a couple of months in autumn, two spiders made our front window their home. It was obviously a good home as they looked well fed! I don’t particularly dislike spiders, but did think that they spoiled the view somewhat. One day, therefore, I chopped down their webs, but the next day they were back just as intricate and extensive as ever. Although they did somewhat dominate the view out of our front window, having them in such a prominent position meant that we could observe their web making skills quite close up. It was quite amazing the way that they managed to build up such intricate, complex structures, and clamber along them, starting from nothing! To sense that behind anything that can be experienced there is a something that our mind cannot grasp and whose beauty and sublimity reaches us only indirectly and as a feeble reflecion, this is religiousness. In this sense I am religious. Dawkins is absolutely right to point out that atheistic – or pantheistic – scientists who use religious or ‘god’ language are not speaking in favour of a Christian God, or arguing for his existence. It is wrong of Christians to use their words for such purposes when this is contrary to their real meaning. However, it is also true to say that other scientists – when they ponder the beauty and brilliance of the universe – do see behing it the work of an even more wonderful God. Indeed I’ve met many for whom this is exactly their response. For me also, when I consider the wonder of our universe I cannot but feel that this could not have come about but for God who chose that it should to come into being and who ultimately is the cause of its existence. I’m not suggesting that this is a proof of God’s existence, but it is an entirely appropriate response. … well maybe just watching them. We recently went on holiday to Swanage in the south of the UK. It’s a great place to holiday with small children and is on the coast – always a good thing (especially for someone who always seems to live in places about as far away from the sea as you can get in the UK!) 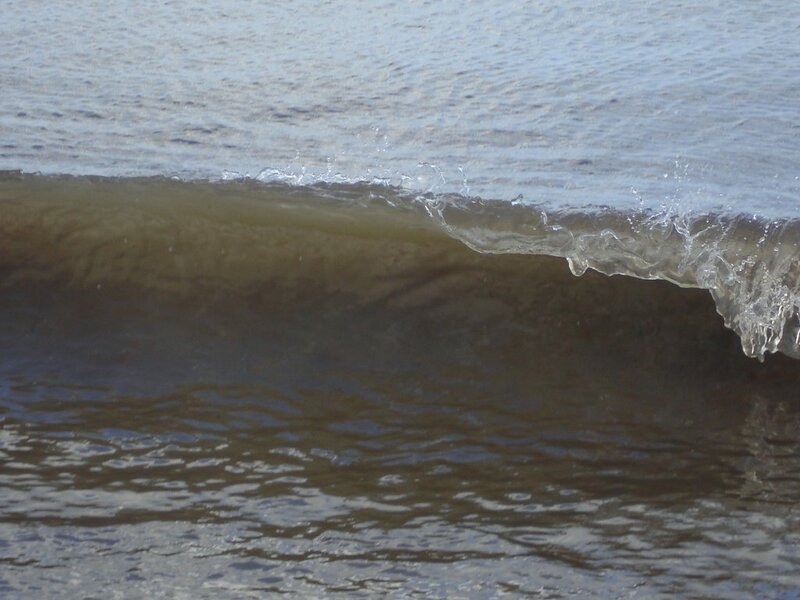 I love watching the sea – and managed to get this photo of a wave breaking which I thought I’d share with you. 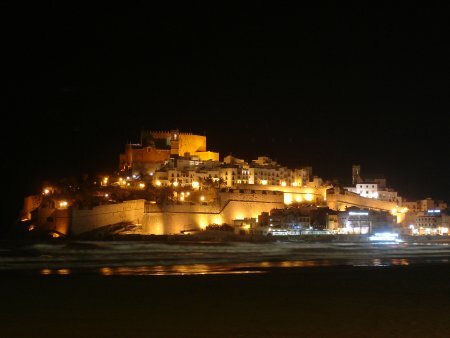 Perhaps I should start a new blog giving photos of picturesque Spanish castles at night. We recently spent a week in Peñiscola, a couple of hours up the coast from Valencia. It was a great week, and has a beautful old castle, which looks great lit up at night. Here’s the photo! I love variety. I did think of giving my blog a name with ‘variety’ in it, however the domains I searched for were all taken. Variety in work can help to keep it interesting and exciting. It also means there’s often something new to enjoy and learn about. And I’m not the only one who enjoys variety. My daughter does too, for example at tea time she likes the variety of drinking out of every cup that’s on the table! There’s another reason I like variety, but I’ll leave that for a later post. My final college essays are now all written and handed in – hooray! This meant that we could all go out for a day trip on Saturday to the nearby town of Newent. There is a nice, small lake in the town. Just going round it, I was struck by the variety in the beauty of nature that we could see there. Nothing particular unusual or outstanding, but beautiful and tremendously varied all the same. The photos below are just a taste of what we could enjoy. 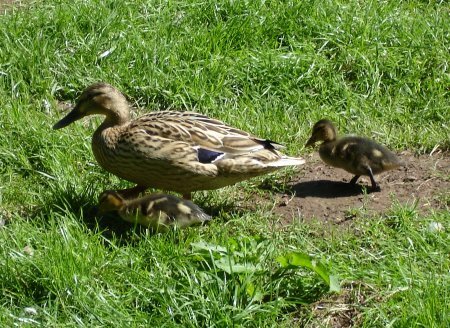 Our little daughter loves ducks at the moment, and there were many of them around of all sizes. 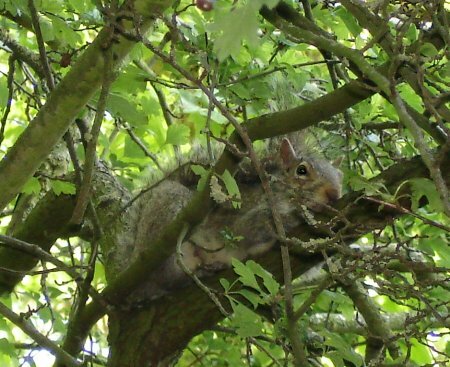 There were plenty of squirrels around too, but photographing them is more difficult. This one was up a tree, and needed a flash to make it light enough. This meant some bad animal eye glare which I’ve had to try and artificially touch up. Hope it looks OK all the same. It’s impossible to capture all the beauty of moving water – I could watch it for ages. 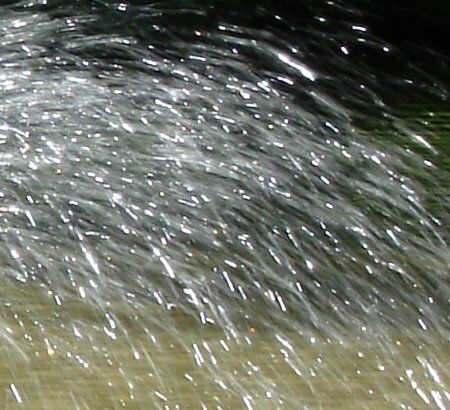 The portion of one photo below just illustrates an element of it, produced by a fountain in the middle of the lake. Here’s another photo from our time in Spain. This is another of my favourites, but for different reasons. It was taken outside a cafe in the square by the cathedral in Valencia. 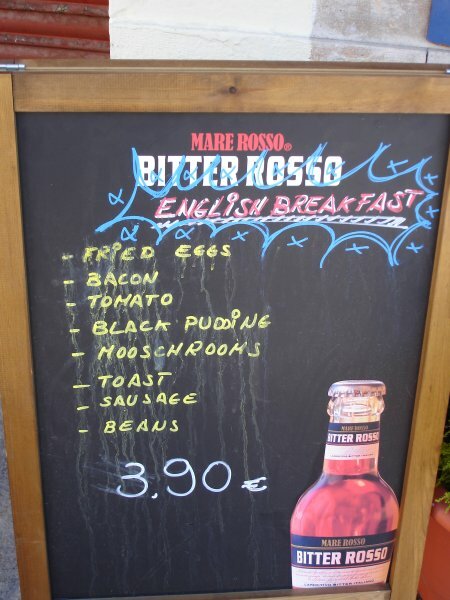 English spelling is difficult, and not only do I admire the bar’s owners for providing a full English breakfast, but they almost get the spelling entirely right. Well I’m back from my six weeks college placement in Onda, Spain. We had a great time and I’ve got lots to say. But for now I’ll just post a portion of one of my favourite photos of Onda. Onda is a thriving and growing industrial town, but it has plenty of history and a lovely old castle up the hill overlooking Onda. This is lit up at night, and is well worth seeing – below. It’s a bit hard to get a view without street lights, other buildings etc in the way, but this is the best I could manage. It also goes to show that if you don’t have a tripod, a baby pushchair can serve the job, if not quite as well, at least satisfactorily! 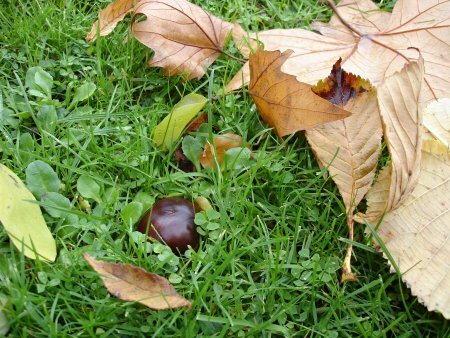 Autumn is my favourite season. 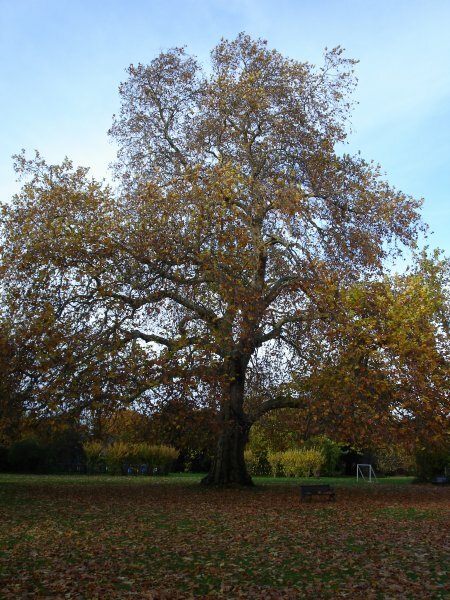 There are a number of reasons for this, but a lot has to do with its beauty – I just love the colours of the falling leaves, and the clear blues skies with bright fresh days (when we get them). Here are some photos taken around college a few days ago, to illustrate just why I like it. 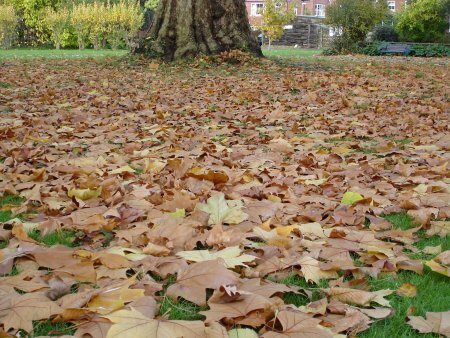 One of my great childhood memories is of being asked to rake up the leaves that fell from our trees into the garden. 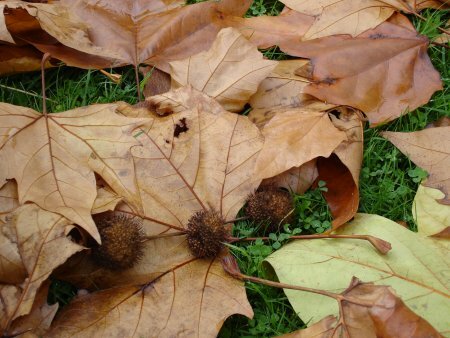 I loved it then and still enjoy just walking through fallen leaves now. Does science prove, or disprove, Christianity? What’s the relationship between science and faith? This work is licenced under a Creative Commons Licence. Please attribute to Geraint Lloyd and link to lloydaboutlife.com when using photos or text consistent with this license.